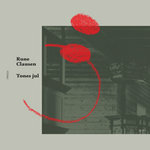 “Tones jul” is presented in the liner notes as a work by Rune Clausen that is a musical trip to the Norwegian forests. In the author's view, this release should sound 'dirty and primitive like early 90s black metal’ which is an hint that the forest, a central topic of the genre, is a place which is as beautiful as menacing. Moreover, it's the place that reminds of a past, more or less idealized, where human lived with the nature not using it. While "Kronisk ferie" is a quiet opener with a simple melody after a field recordings of a park, "Tones drøm" introduces the listener towards the framework of this release: a fusion of synth based ambient and field recordings which has a certain evocative character. "Sølje" evolves with a sequence of drones with careful timbres while "Myrgvarv" maintains a remarkable tension. "Det sorte sovekammer" uses a female voice which narrates perhaps a story about the forest and "Tones mor" has a spectrum which reminds of old '30s records. "Barnsnød" is a long and highly structured track which uses samples to create a menacing atmosphere underlined by the grave notes of the synth. "Hræzla" is a quiet and almost melancholic track and "500 år senere" closes this release with the return to field recordings of the first track. The musical development reveals the clear plan behind the plot which is exposed to the listener and the use of field recordings is not a mere expedient of mise-en-scène, but an element of the discourse. It's really worth a listen. Massergy is the project name of Eric Jensen, based in Austin Texas, and 'Fire Opal' is his debut album on Spotted Peccary. This may be a case of the recording process being as interesting as the music, for Massergy produced this album entirely without the use of computers, sequencers or plug-ins, using hardware synths only and acoustic guitar (and maybe some electric as well), and not only that- recorded and mixed the entire album outdoors- at night no less! (Hmmm...floodlights or tiki torches I wonder...) How's that for melding electronic-ambient with nature! Jensen says he shares his recording environment with coyotes, owls, deer, and other creatures (of the night I guess), and not only that, it was recorded under whatever weather conditions prevailed. (I'm guessing downpours and Texas twisters were out for practical reasons.) The music over the 7 tracks totaling 70 minutes is predominantly new age ambient, but that's not a bad thing as Jensen manages to avoid the clichés the genre is often subject too. In spite of the flashiness of the title, the majority of the music on the album is placid and low key. It's languid, lazy and contemplative, and despite being played/recorded at night, it doesn't conjure strictly nocturnal images. It could well be a sunny or rainy afternoon, a cloudy dawn, or a majestic sunset. The opening piece "Vinesong" is the closest thing resembling a song with some structure by the acoustic guitar. "The Shepherdess' has seemingly sequenced/arpeggiated notes that you're going to have a hard time believing weren't programmed into a sequencer, but there is a more natural feel to them than if they were. That takes a good amount of skill and discipline. There is an improvisational feel, yet purposeful drive to Massergy's compositions and a light touch prevails throughout. Without straying too far afield Massergy provides just enough sonic diversity to keep your attention but not overwhelm you. The 17:17 title track is a bit darker and denser than the others and weaves an aura of mystery. The one thing most listeners should agree on though is that 'Fire Opal' is a very relaxing, tranquil and meditative album, perhaps just the thing needed after a stressful day in the real world. For a debut album, it's a wonder.